Born in Sagua La Grande, Cuba, Lam studied at the San Alejandro Academy in Havana and at the San Fernando Academy in Madrid in 1923. In 1938 he went to Paris and met Picasso and the Surrealists. 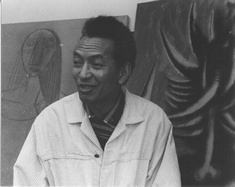 Lam exhibited in 1939 at the Galerie Pierre Loeb and worked in Picasso's studio. He illustrated Breton's book Fata Morgana in 1940. In 1941 he sailed from Marseilles to Martinique with André Masson, André Breton, Claude Lévi-Strauss, Victor Brauner and others. He returned to Cuba in 1941 and developed a new awareness of Afro-Cuban traditions, as is reflected in his work of that period. During other Caribbean travels he became interested in voodoo and incorporated it's imagery into his paintings. In 1951 Lam returned to Paris, living there and in Italy. Wifredo Lam's work was included in the 1987-88 traveling exhibitions Art of the Fantastic organized by the Indianapolis Museum of Art. 1992 was a particularly important year for the artist due to the amount of exhibitions dedicated to his work, among them: The Hirshhorn Museum, Washington DC, Crosscurrents of Modernism; Four Latin American Pioneers: Diego Rivera, Joaquin Torres-García, Wifredo Lam and Matta; Centro Cultural Arte Contemporaneo, Mexico City; Museo de Bellas Artes Collection in Havana, Cuba, Wifredo Lam, Works on Paper; America's Society Art Gallery, New York, Wifredo Lam, A Retrospective of Works on Paper which traveled to Fundacion La Caixa in Barcelona; and the retrospective of Lam's work that opened in December 1992 at the Studio Museum of Harlem, Lam and his Contemporaries: 1938-1952.